I really love the look of the Typeset dsp painted with a layer of gesso. Gesso can be found in the art supply section of your craft store. Now I’m no expert on this, but I think it’s kinda like a primer for artists’ paintings. It adds a little texture, and I love how it just mutes the paper when you lightly apply it. It does take a little while to dry, and then you’ll also need to allow some time for any images you stamp on it to dry as well. 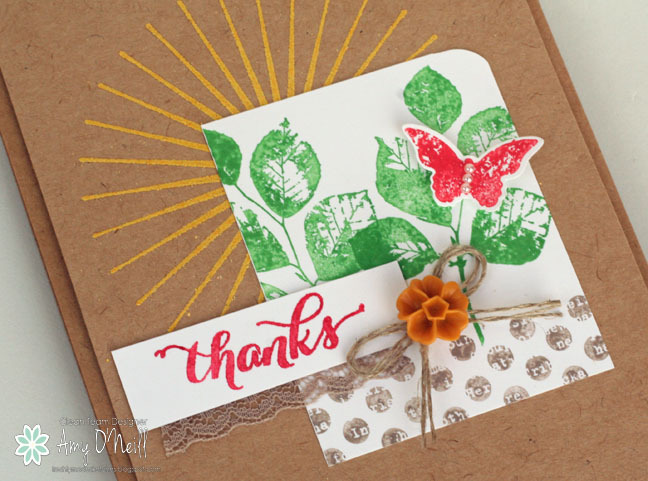 I know I’ve used this stamp set so much, but I still love it, and I hope you do too. I’ll bet you’ve figured out by now that Kinda Eclectic is probably my favorite new stamp set in the annual catalog this year. 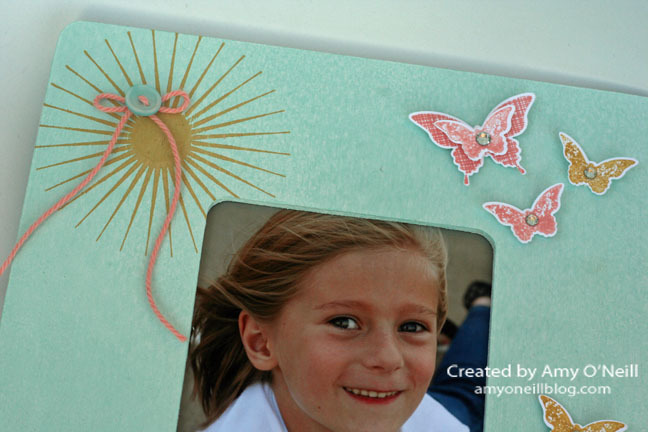 So I figured that it was the perfect set to scrapbook one of my favorite photos of my youngest child. I started by layering some Typeset dsp, which I had painted with a layer of gesso, and some of the Gold Fancy Foil Designer Vellum behind the photo. I wrinkled up a doily and layered some pretty ribbons as well. 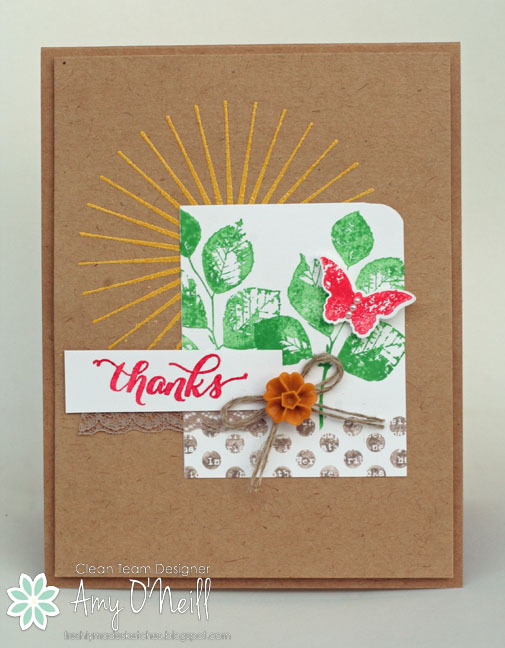 The sentiment was stamped and embossed with white Stampin’ Emboss Powder. I added some stamping on the Crumb Cake page and some sequins. And then I embellished with lots of butterflies. This page was made for the convention display boards to show how once could use the Kinda Eclectic stamp set for scrapbooking. 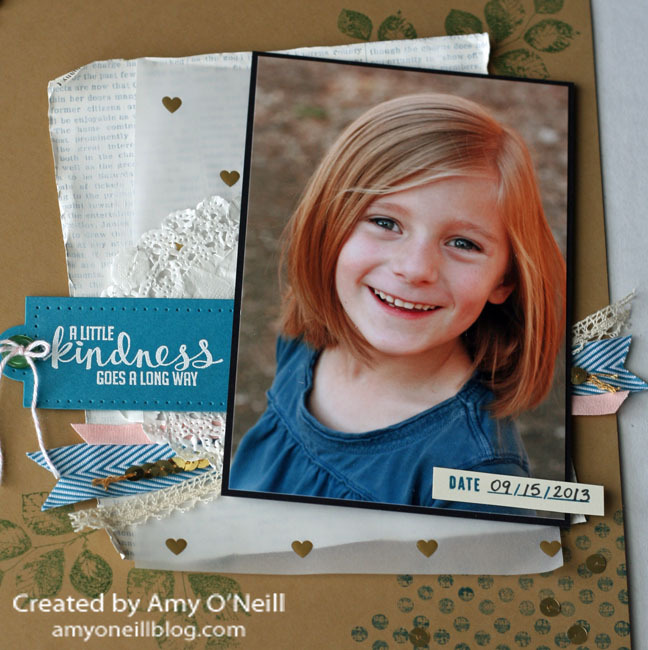 Since this set is perfect for layering, it is a great set for scrapbooking. 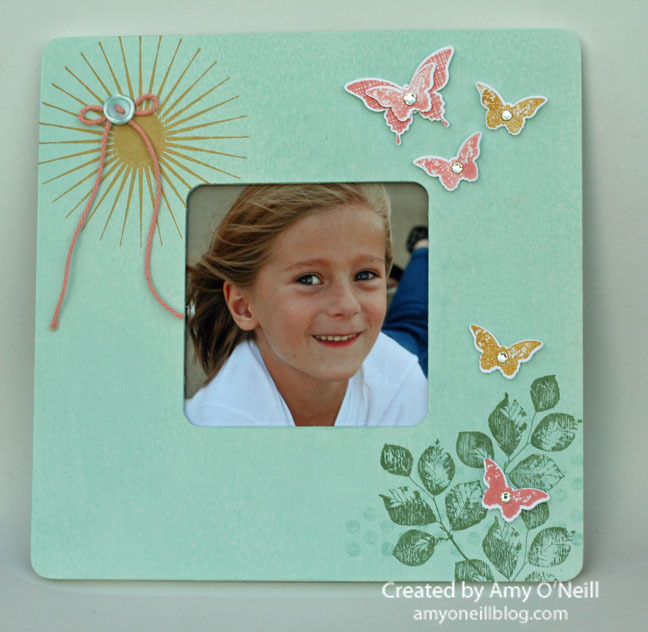 Here’s a picture frame I decorated using the Kinda Eclectic stamp set for the convention display boards. I bought a plain wood frame from a big box store for $1. I painted it white with some acrylic paint. After it dried, I spritzed it with a mixture of Pool Party ink and rubbing alcohol a few times, until the color was as dark as I desired. 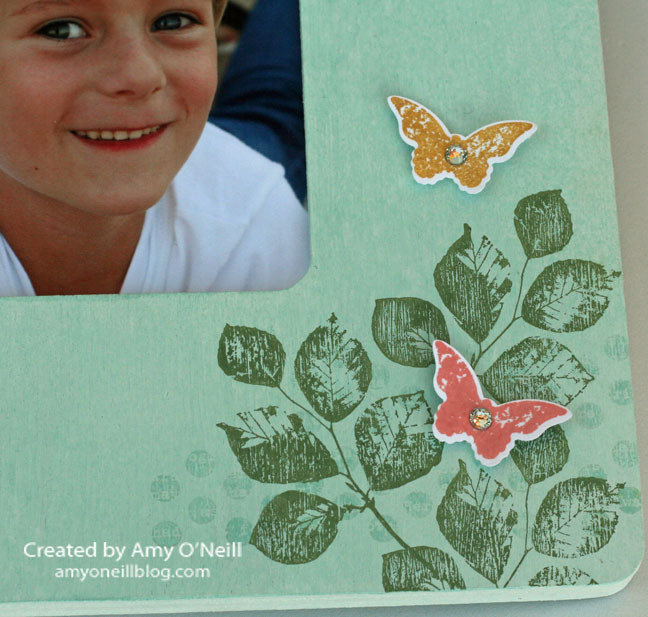 Once that was dry, I stamped on the frame and added some embellishments for decoration. This was an easy project. Now I need to make another one that I can keep. One of the stamp sets for which I made samples for the convention display boards was Kinda Eclectic. This was my favorite set, and I still love it! I’ll share two of the cards I made using it today. I used the color combo of Hello Honey, Calypso Coral, Smoky Slate, and Coastal Cabana on this one. 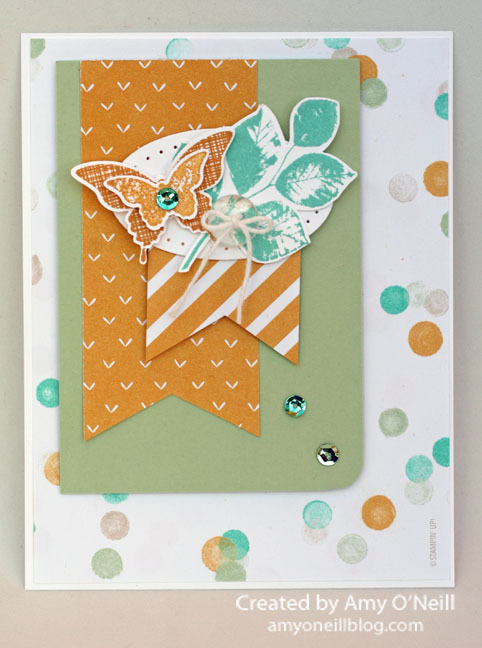 I also used a couple of the In Color sequins on the centers of the butterflies and some Basic Gray baker’s twine as well. Lots of fun stuff on this card! 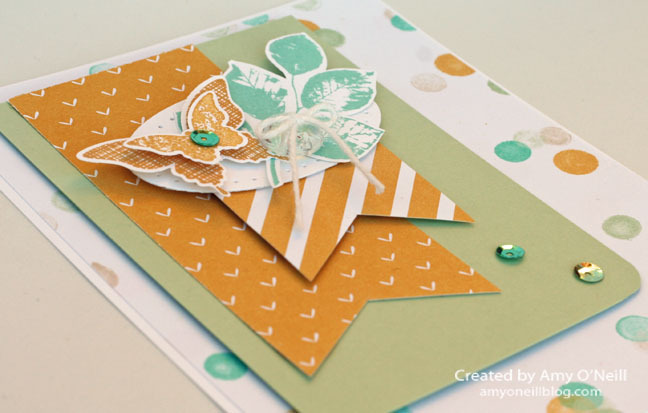 I used a similar color combo with this card — just substituting Pistachio Pudding for the Calypso Coral. I used some more of the In Color Sequins and some of the Lullaby dsp. 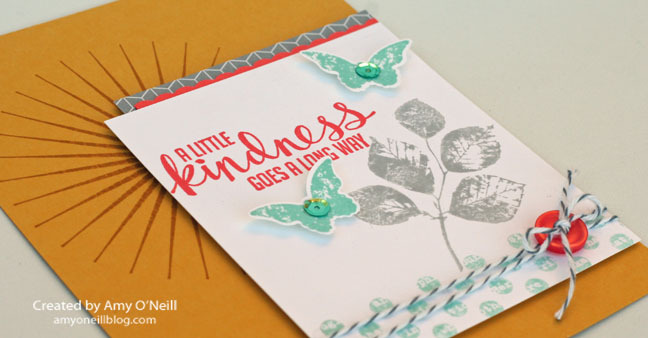 I pierced holes around some card stock punched with the Extra-Large Oval punch using the Essentials Paper Piercing Pack. All of the convention display stampers will be pinning their projects as they post them to a special board on Pinterest. It will be a great place to see all of the projects that were on display for the three convention stamp sets plus some Project Life samples as well. You can just click on the button below to see the Pinterest board. Enjoy your Tuesday! Be sure to come back tomorrow as I’m hosting the next challenge for Freshly Made Sketches. Thanks for stopping by! 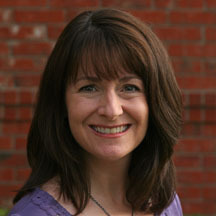 Greetings from our last day of Stampin’ Up’s annual convention (sniff, sniff). 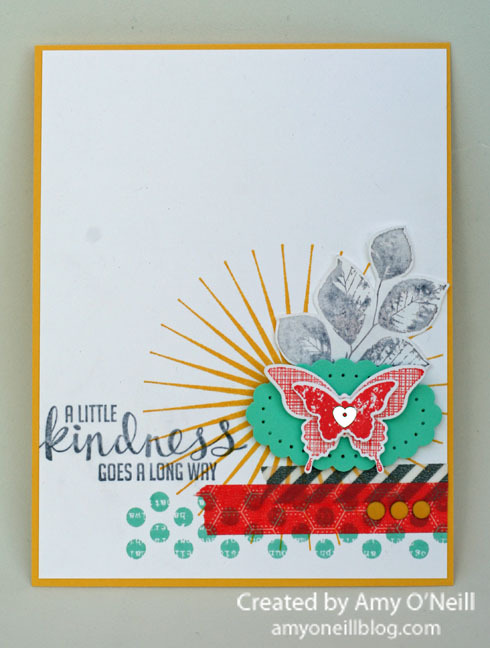 I have another one of my swap cards to share with you today. All of the stampers who made projects for the Convention display boards agreed to swap one of their cards with each other. Talk about a fantastic swap! 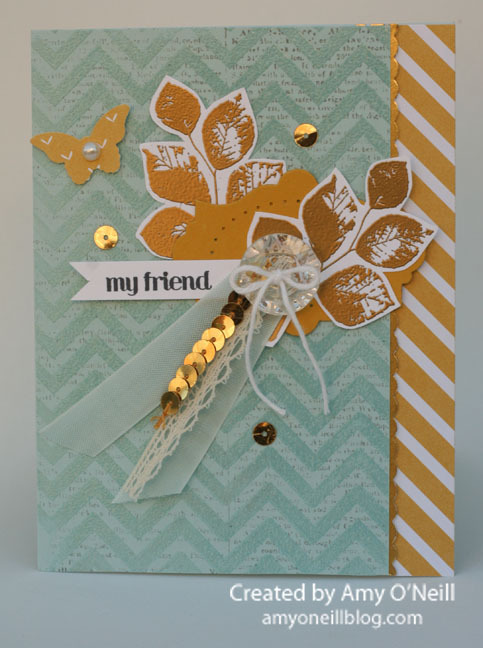 I started by embossing the Positively Chevron background stamp on Soft Sky card stock with clear embossing powder. 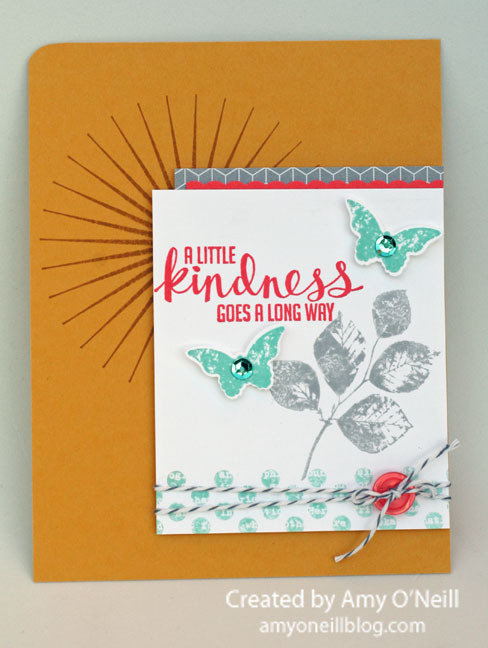 I then stamped the Dictionary background stamp with Basic Gray ink, and stamped off once on scratch paper before stamping over the chevron stamped card stock. 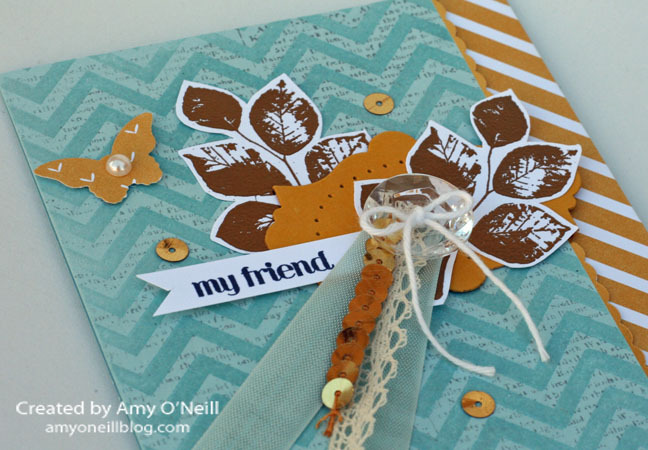 I embossed the leaf images with gold embossing powder and cut them out. The little scalloped edge between the Soft Sky card stock and the Lullaby dsp strip was punched from a Gold Foil Sheet. I cut a label using the Apothecary Accents framelits and then paper pierced an oval shape from the Essentials Paper Piercing Pack on the label. I then added some fun ribbons — Soft Sky 1/2″ Seam Binding Ribbon, Venetian Crochet Trim, and Gold Sequin Trim. The sentiment is from the sentiment set, And Many More, which I borrowed from a sweet friend. 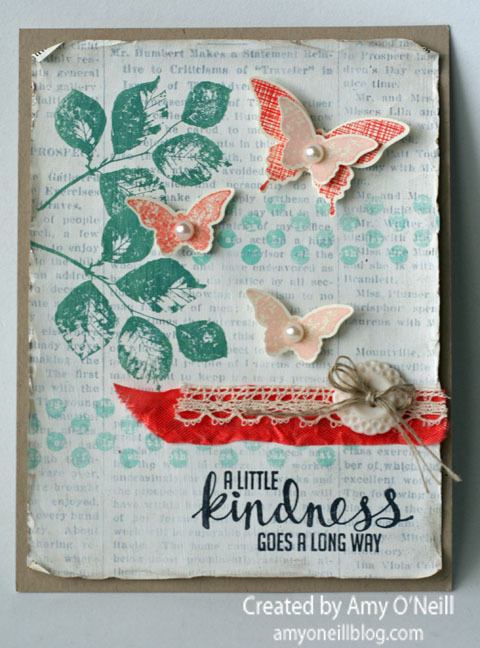 Come back tomorrow evening for another Monday Montage blog hop. 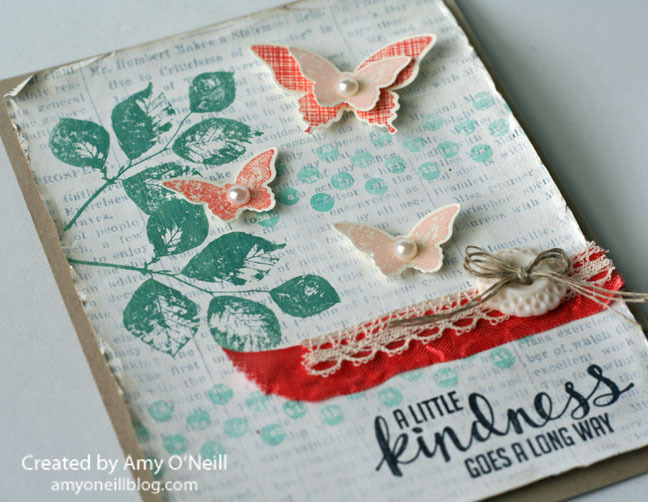 I’ll be sharing the card I made to swap with that group of fabulous ladies. 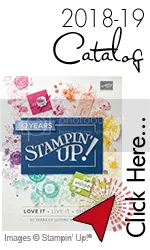 Stampin’ Up’s annual convention starts today in Salt Lake City, and I am so excited to be there! This is an event that I look forward to every year. 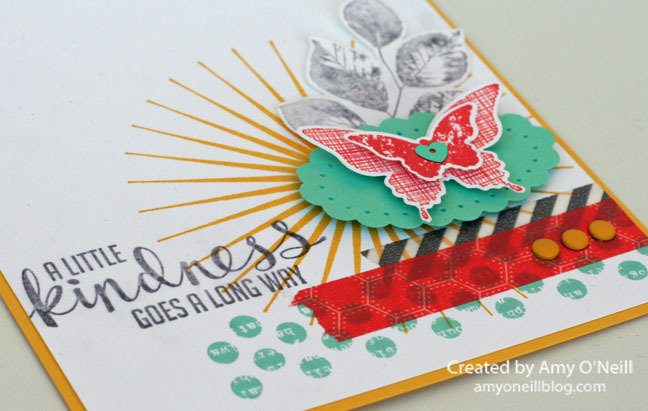 I love spending time with stamping friends (some of whom I only get to see once a year) — it’s like a girls get-away. And I get to see lots of stamping demonstrations and cool products. It’s a great week! One of the fun things I always look forward to is swapping. I made three different swap cards this year as I signed up to swap with three different groups. Here is one I swapped last night at our team swap. I used one of my favorite sets, Kinda Eclectic, and used a color combination of Hello Honey, Coastal Cabana, Calypso Coral, and Basic Gray. The washi tape is from the Retro Fresh set. I’ll have lots more to share with you from Convention in the days ahead, including lots of samples I made for the display boards.